Swami Vivekananda, the great soul of humanity was born at 6:33, a few minutes before sunrise, on Monday, January 12,1863. It was the day of the great Hindu festival Makarasamkranti, (Makara Sankranti) when special worship is offered to the Ganga by millions of devotees. Swami has turned in His Works to Vivekananda as the great soul of humanity innumerous times. "Note that Buddha, Jesus Christ, Sankaracharya and Vivekananda, great Sages and Saints and Devotees of the Lord, all these are treasured in the memory of man even unto this day. What quality made them all memorable for all time? I say, it is the character of each one of them. It is the fragrance of the flower; it gives value and worth. Among the qualities that make up a flawless character, Love, Patience, Forbearance, Steadfastness, Charity - these are the highest, these have to be revered." (Excerpts from: Sathya Sai Baba. Prema Vahini. Noble Qualities from the Path for the Aspirant. Page 1). Brief testimonials from his life and mission of the great saint has represented. The mother, Bhuvaneswari Devi, accepted the child as a boon from Vireswara Siva and named him Vireswara. The family, however, gave him the name of Narendranath Datta, calling him, for short, Narendra, or more endearingly, Naren. The family of naren was well known for its affluence, philanthropy, scholarship, and independent spirit. 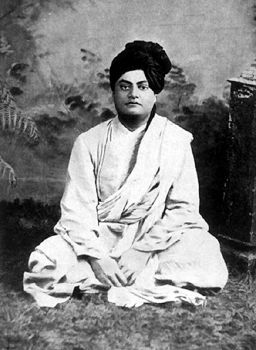 Born Narendranath Dutta, in Kolkata, India, he became famous as Swami Vivekananda, when he became the chief disciple of Sri Ramakrishna Paramahamsa. He studied philosophy at the Scottish Church College, Calcutta. He examined the histories of different countries and various philosophical systems. Aristotle and Plato, Kant and Hegel, together with Sankaracharya and Buddha, Ramanuja and Madhva, Chaitanya and Nimbarka, were thoroughly discussed. The Hindu philosophical systems of Jnana, Bhakti, Yoga, and Karma, each received a due share of attention, and their apparent contradictions were reconciled in the light of Sri Ramakrishna's teachings and experiences. During the life, he never let them forget the goal of the monastic life: the complete control of the lower nature, the realization of God within as Oneness with Atmic reality and equality of all things and objects in Maya reality. "Before realising the need for equal mindedness, Ramakrishna Paramahamsa* was attaching importance to things like wealth and position. On one occasion, with a view to test Ramakrishna, a disciple called Narendra or Vivekananda kept gold coins under the bed of Ramakrishna. Immediately Ramakrishna got up because he felt as if his body was burning. The inner meaning of this story is that Ramakrishna was still seeing the distinction between gold on the one hand and mud on the other and so on. It means that he had not got over these differences. At that moment he was still distinguishing one thing from another, but later, Ramakrishna held mud in one hand and gold in the other and kept on exchanging them, till he lost the sense of distinction between them. He had then realised the equality or the oneness of them." (Excerpts from: Sathya Sai Baba. Divine Discourses "Seek Work, Worship and Wisdom-Avoid Wealth, Wine and Women." Summer Showers in Brindavan, May 1973). (* Sri Ramakrishna Paramhansa (1836 - 1886) was a great teacher of Advaita Vedanta Hinduism. He declared that all religions lead to the same goal, placing spiritual religion above blind ritualism). Still today Vivekananda (1863 - 1902) has remained in the memory of spiritual seekers as one of the most famous and influential saint of the Hindu religion of the nearest past. He delivered innumerable lectures, wrote inspired letters in his own hand to his many friends and disciples, composed numerous poems, and acted as spiritual guide to the many seekers who came to him for instruction. He also organized the Ramakrishna Order of monks, which is the most outstanding religious organization of India. It is devoted to the propagation of the Hindu spiritual culture not only in India, but also in America and in other parts of the world. He found that it is his duty to teach the youth and develop the broad outlook to social problems. His main contributions about Advaitin thinking (consciousness) are not only philosophical but showed how Advaita philosophy also has social, even political, consequences. His own life was an example of Advaitin thinking. "The path that has been described in the context of a monkey and the path that has been described in the context of a cat, seem to be all right in common parlance and so far as ordinary persons are concerned and in their daily life, they are not so in the case of a person who is devoted and who wants to know the real inner meaning of Atma or the soul. Such a person will have to find a path which is different from these two and superior to these two. To give you the meaning and the character of this devotion, Vivekananda had a good example." (Excerpts from: Sathya Sai Baba. Divine Discourses "Lessons From The Gita." Summer Showers in Brindavan, May 1972). Vivekananda taught the branch of Vedanta what declared that no one could be truly free without detachment. Even the desire for personal salvation has to be given up, and only tireless work for the salvation of others is the true mark of the enlightened person. "The aspect of Brahman is something which is beyond time and easy reach and if we want to understand it, we ourselves must adopt methods which are above and beyond time. It is in this context that our ancients have said 'Brahmavit Brahmaiva Bhavathi' meaning that one who knows the aspect of Brahman will himself become Brahman. Vivekananda once said that if anyone wants to understand his sagacity and his ability, he must first himself become an able and sagacious person. The result of your effort would depend on the extent of your effort and your sacrifice. The final result will only correspond to the effort that you put in. This power of strength which we attempt to describe by the word Brahman is not something which is external to and is outside you. It is present in you and is in your own self. If you acquire some good or bad and if you are in the misapprehension to think that Brahman outside is causing good or bad to you or that he is giving some punishment to you, this is not the right attitude." (Excerpts from: Sathya Sai Baba. Divine Discourses "Brahman Denotes The Totality Of Prajna In The World." Summer Showers In Brindavan, May/June 1974). The goal is to manifest this divinity within what is the whole of religion. Doctrines, or dogmas, or rituals, or books, or temples, or forms, are but secondary details. His books (compiled from lectures given around the world) on the four Yogas are still remained as fundamental texts for anyone interested in the Hindu practice of Yoga. At the 1893 World Parliament of Religions in Chicago, Vivekananda earned wild applause. "When Swami Vivekananda introduced a new form of address at the Congress of Religions in Chicago, instead of addressing them as 'Ladies Gentlemen', he addressed them as 'Brothers and Sisters'. It was quite new to the foreigners and they were so much touched and moved by that gesture that they applauded him incessantly for 15 minutes. Of course, nowadays too, we are addressing the audience as sisters and brothers, but that feeling is not there in our heart even for the time we are on the platform. What we do not feel in our heart should not be expressed outwardly. We must give place to true feelings in our heart and we must try to practice good things in our life." (Excerpts from: Sathya Sai Baba. Divine Discourses "Destiny and Divine Grace." Summer Showers in Brindavan, May 1972). Within a few years of the Parliament, he had started Vedantic centres in New York and London, lectured at major universities and generally kindled western interest in Hinduism. After this, he returned to India. Swami Vivekananda was the first Asian to be invited to accept the chair of Oriental Philosophy at the Harvard University. In his honour the Indian National Youth Day is celebrated on his birthday. Vivekananda strove to promote peace and human brotherhood on the spiritual foundation of the Vedantic Oneness of existence. Vivekananda had a direct and intuitive experience of Reality. He derived his ideas from that unfailing source of wisdom and often presented them in the soul-stirring language of poetry. The natural tendency of Vivekananda's mind, like that of his Guru Ramakrishna, was to soar above the world and forget itself in contemplation of the Absolute. But another part of his personality bled at the sight of human suffering in East and West alike. It might appear that his mind seldom found a point of rest in its oscillation between contemplation of God and service to man. Be that as it may, he chose, in obedience to a higher call, service to man as his mission on earth. SWAMI VIVEKANANDA: I have to come back once more. The Master said I am to come back once more with him. MRS. ALLAN: You have to come back because Shri Ramakrishna says so? SWAMI VIVEKANANDA: Souls like that have great power, Madam. The story about the rebirth of Swami Vivekananda and his future involvment in the Sai Mission is well documented in the book "Sai Inner Views and Insight" by Howard Murphet, the well know and renowned worldwide author and devotee of Bhagavan Baba. Here are some brief notes. In the late 1960's Howard Murphet was in India with his wife Iris in one of the Sai ashram. In that occasion, Baba told Murphet and his wife: "Vivekananda has been reborn in Sri Lanka. When his education and training are complete, he will help me with my mission." The same announcement has been made by Swami to Andrew Schartz and to a few of his friends. In March of 1987 a young man from Sri Lanka, whose name is Nalin Sedera, visited Prashanti Nilayam along with a group of people from his own country. An Australian devotee, Elvin Gates, was in the interview room with this group of Lankan people. Elvin Gates told that Sathya Sai Baba made the revelation to the young man the he was Vivekananda reborn. This took place on two successive days during two interviews in the private interview room. After the interview the news quickly spread throughout the ashram and crowds began to follow the young man. Two years later, in 1989, Howard Murphet had the opportunity to talk to Nalin himself and had numerous information regarding the two interviews that he has had with Sai Baba. Nalin said that before meeting Sathya Sai Baba he had a dream in which Swami, wearing a white dress, showed him an old couple, saying that they was his parents in a previous incarnation. When Nalid asked Swami to speak about his parents, Swami replied: "Forget about that. I am your father and your mother." In the interview room Swami asked him: "What is your name?" Nalin replied: "Nalin." Swami said: "Your are not Nalin, you are Naren." Narendra was the name of Swami Vivekananda and Naren was the name that Ramakrishna akways used for his beloved disciple, Narendra. Then Swami said: "In your previous birth you were a great saint. Do you know who Narendra was?" Nalin replied: "No, Swami, I don't." Sai Baba went on: "Narendra was the name of Vivekananda." "I have been waiting for you for eighty-five years. ", Swami said. Vivekananda left his body in 1902 and the interviw was in 1987, exactly eighty-five years later. Swami said to Nalin that he will come to live in the Prashanti Nilayam ashram in the year 2021. That is the year in which Sathya Sai Baba has announced he will leave His body. Howard Murphet also says that Nalin has been back later to the ashram secretly and in incognito more than once.